The State Apartments reflect the changing tastes of successive monarchs and are renowned for their fine plasterwork ceilings and magnificent furnishings, particularly the unrivalled collection of Brussels tapestries. One of the most famous rooms in the Palace is the Great Gallery, hung with Jacob de Wet’s portraits of the real and legendary kings of Scotland. Included on the visit, a display focuses on the Order of the Thistle, the highest honour in Scotland. The Order honours Scottish men and women who have held public office or who have contributed in a particular way to national life. Shown alongside historic insignia is an example of the mantle worn at the Thistle ceremony at St Giles’ Cathedral in Edinburgh, which The Queen attends during her visit to the Palace in July. 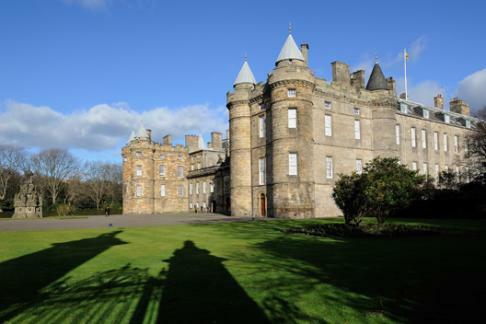 From 1 April to 31 October the gardens, which are today used for garden parties, can be included as part of a visit to the Palace of Holyroodhouse. Visitors to the gardens must keep to the paths, which are about 400 yards long.